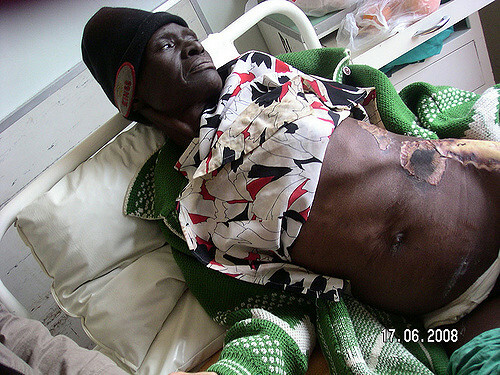 The Zimbabwean newspaper published numerous verified reports of election violence in 2008. Here is a selection from our archives for anyone whose memory needs jogging. Â HARARE – President Robert Mugabe has put his hawkish right hand man Emmerson Mnangagwa in charge of the joint operations committee (JOC), an influential group of hardliner securocrats working to ensure the veteran leader wins a second round presidential ballot. Â The JOC comprises the commanders of the army, air force, police, prison and intelligence services and was chaired by State Security Minister Didymus Mutasa before Mnangagwa took over. The secretive JOC has played a major role in Zimbabwe’s politics from behind the scenes. Â Another Mugabe loyalist and central bank governor Gideon Gono sits on the committee as an economic advisor with key responsibility to finance its activities. Â Impeccable sources said Mugabe replaced Mutasa with Mnangagwa as chairman of JOC immediately when he became aware he had lost the March 29 presidential election to opposition Movement for Democratic Change (MDC) party leader Morgan Tsvangirai. Â According to the sources, Mnangagwa’s first action was to advise Mugabe not to concede defeat but that he should force a second round run-off election and that at the same time the veteran leader should put pressure on the Zimbabwe Electoral Commission (ZEC) to delay official results of the election. Â Mugabe wanted to accept the outcome of the elections, but was advised by Mnangagwa and other JOC members not to do so, one of the highly reliable sources said. He was told to instruct ZEC not to announce the results while the JOC worked out a plan to either rig the poll or ensure there would be a run-off that the President would win. Â According to sources it was Mnangagwa who advised Mugabe and the ruling ZANU PF party to demand vote recounts in 21 constituencies – all as a ploy to further delay the release of the results and allow state security agents and ZANU PF militants more time to terrorise voters and cow them to back Mugabe in a second ballot. Â The JOC, the sources said, rejected outright overtures from the MDC for a government of national unity. Â The powerful committee instead opted for a campaign of violence against opposition supporters that has left many parts of Zimbabwe in a war-like situation, with unofficial curfews imposed by security forces, while scores of MDC supporters have been murdered and thousands others displaced from their homes. Â The violence in the countryside being perpetrated against opposition supporters is the brainchild of the JOC. The idea is to force the electorate into voting for Mugabe during the run-off, said one source. Â Mnangagwa, who helped Mugabe impose himself as ZANU PF’s presidential candidate and is the 84-year old leader’s chief election agent, declined to comment on his role in the JOC and in the deepening electoral crisis in the country. Â Since when have we revealed to the press how we are doing things in government, He said. I have nothing to confirm or deny, besides to say we are the government. Â Vote recounts completed this week confirmed the MDC’s historic victory over ZANU PF in the parliamentary poll and left analysts wondering why in the first place Mugabe’s party so adamantly demanded the recounts. Â The ZEC announced on Tuesday it would meet presidential candidates or their agents on Thursday to verify results before they are made public, as the Harare authorities appeared to be bowing to pressure by the international community for poll results to be released. Â “Candidates who participated in the 2008 presidential election or their chief election agents are urged to attend as this exercise will pave way for the announcement of the result of the presidential election,” state radio announced, as the United Nations Security Council prepared to meet in New York to discuss Zimbabwe’s post-election crisis and violence. Â The MDC says at least 15 of its supporters have been murdered while another 3 000 have been displaced in the violence, which it the opposition party has described as a war being waged by state security forces and ZANU PF militants against Zimbabweans. Â The opposition party’s secretary general Tendai Biti was expected to brief the Security Council on the deteriorating situation in Zimbabwe and to ask that the world body send a special envoy to probe violence and human rights abuses committed by state agents against opposition supporters. Â In a statement released ahead of the Security Council meeting, Louise Arbour, UN High Commissioner for Human Rights, said she had received reports of serious acts of violence against human rights defenders in Zimbabwe. Also speaking ahead of the Security Council meeting, the New York-based Human Rights Watch urged the council to recognise violence in Zimbabwe as a “threat to regional peace and security” in the rest of southern Africa and called for targeted sanctions against those responsible for the violence. – ZimOnline.